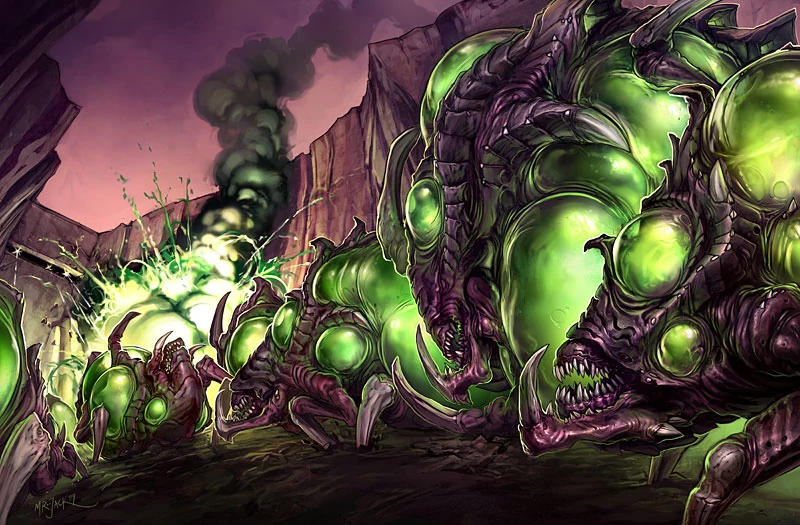 These are Banelings, creepy, crawly little Zergling suicide bombers, and you probably want to be careful when chasing them, especially in a pro level StarCraft match. Earlier today, the (get ready for a mouthful) 2017 AfreecaTV GSL Super Tournament 2 drew to a close in South Korea. Taking place at the end of the country’s GSL Season, it pits some of the top players from around the world against one another, and this year’s event proved unusually competitive. As a result, there were a lot of great moments, including one particular Baneling play that was a textbook example of how to micro your army during retreat. Lee “Rogue” Byung Ryul, who went on to eventually win the tournament, was playing against Lee “INnoVation” Shin Hyung in a tough-fought semifinals with everything on the line. Both players had won two of the previous four matches in the series, and INnoVation was favored to win. But Rogue proved too durable, playing some of the best StarCraft of his career as evidenced in the below clip. Surrounded on all sides, Rogue was trying to relocate some his forces to a more advantageous position from which to buy some time to launch a counter-attack. As his units climb up the ramp, he leaves one Baneling behind to burrow underground. Blink and you’d miss it. As INnoVation’s Terran soldiers march up and around the bend in pursuit, Rogue triggers the bomb and takes fifteen or so enemies with it, slowing his rival’s aggressive march. Minutes later Rogue was able to mount an attack of his own against INnoVation’s northern side and decimate half the base, clinching victory by minute fifteen. As an real-time strategy game, a lot of StarCraft II involves cautiously building out your resources and army until a slight edge due to clicks-per-minute or early mistakes by the opponent can be leveraged in a war of attrition. Rogue’s retreat however offers other side of that coin, which is more thrilling to watch and not less crucial. From there he went on to face Kim “herO” Joon Ho in another closely contested series that ended up going the full seven games. Rogue ended up getting the better of herO in the end though, pulling out an astounding thirteen match run that earned him a spot in the WCS Global Finals at Blizzcon 2017. You can re-watch both the semifinals and grand finals for this weekend’s GSL Super Tournament here.